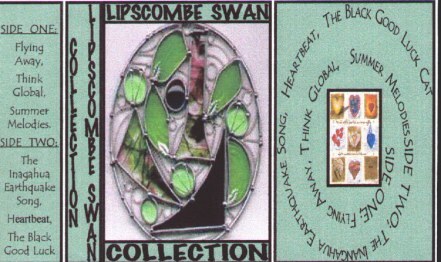 Lipscombe Swan's First release was recorded live in one session at David Bowater's OHO Studio. Originally intended as a demo it was the first time the duo had really heard the sound that their audiences were hearing. The songs were recorded exactly the same as they were performed and it was decided to have a small print run so that there was something to sell at the local gigs. The tape release immediately sold out, as did the next three print runs.. This first tape features 8 original songs of Mike's plus a couple of early Simon and Garfunkle tunes. 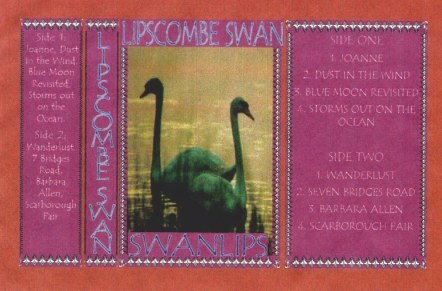 Lipscombe Swan's second release " Swanlips" was of sessions that took place with Ray Barber at EDGE SOUND which was based (at that time) near the tiny village of Brightwater. The studio had been built above an old barn and being miles from anywhere it was ideal for getting away from the influences of people 'dropping in'. 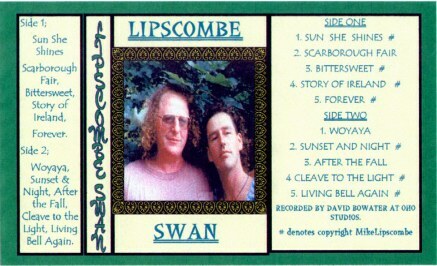 The tape is a selection from the cover songs the duo were performing at live gigs at the time. Initially 'Collection' was released to feature the song "Flying Away" which was a tribute song written by Mike about John Denver's untimely death. Other songs included were songs which had been recorded already but for some reason or another had not made it onto earlier albums.